Now On Sale! 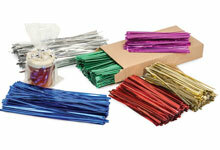 Paper and Foil Wired Twist Ties available in two precut sizes. FourPly Natural Cotton Bakers Twine in a variety of bold colors. Ecofriendly Twine in solid colors made from natural jute fibers. 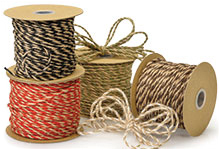 Unique Three Ply Jute Twine is two tone and eco friendly! 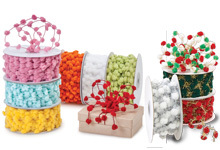 Creative Pom Pom Ribbon with easy to shape wire in fun bright colors! Elastic Stretch and Inelastic Braided Tie Cords in metallic colors. Twine is a great natural, earth inspired option to complete your projects at home, work and school! 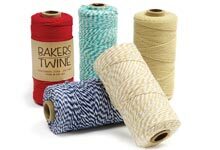 Baker's Twine is made in the USA with 4 ply cotton strands! It is perfect for wrapping up pastries, breads, cupcake and cake boxes! Baker's Twine also makes a great petite crafting choice with the many colors and combinations to choose from! 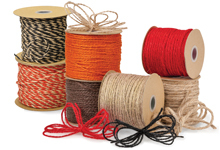 Our jute twine is offered in two-toned colors or several solid choices! Wire twist ties are great for closing a Cellophane Treat bags, securing bows or crafting. The wire center is completely wrapped in foil or paper. Choose from metallic twist ties or paper covered twist ties in 4" or 6" sizes! Or choose the metallic color assortment so you have a wide range of colors on hand! 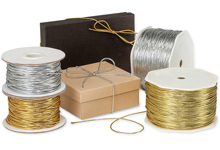 Reminiscent of twine, but with a little more shine, we offer cords in metallic gold and silver. Non-elastic cords are great for dressing up a clear cellophane treat bag! Use the stretch cords when you have a gift box that needs some tension to remain closed.